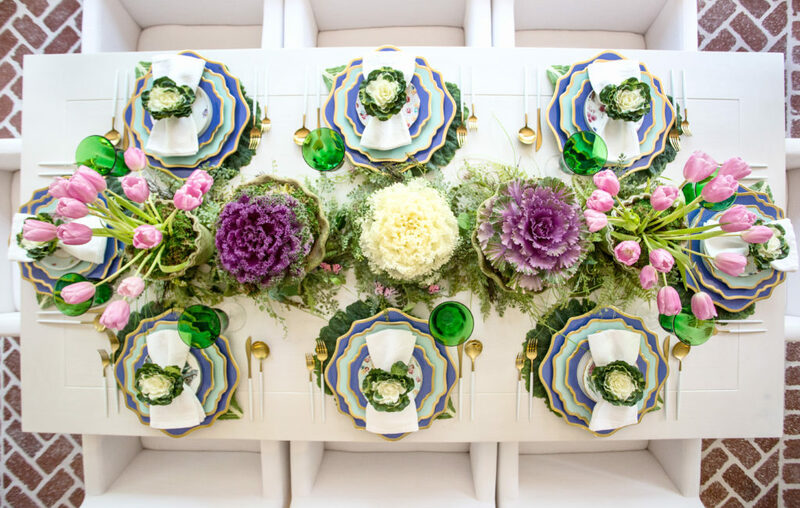 I can’t resist using pastels for Easter, but that doesn’t mean it can’t be bold either! Now that my kids are older, I seem to have adapted my holiday decor so that it isn’t confined to a particular day, but more of a season. For example, I haven’t used a bunny for an Easter table, a ghost for Halloween or Santa Claus for Christmas in a really long time. 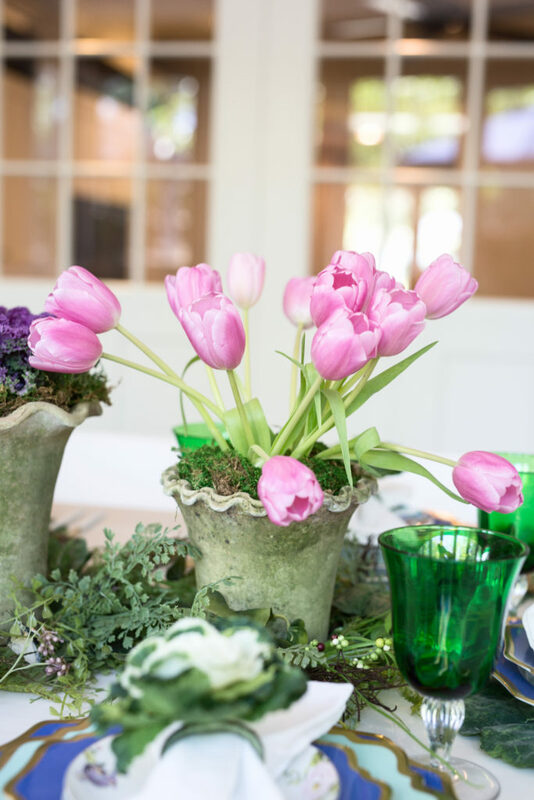 Rather, I will use tulips for Spring decor, moody, dark colors for Fall and lot of lights and greenery to celebrate the holidays. In addition, I’ve gotten very adept at using what I already have, and supplementing with new, smaller items, such as salad plates, napkins or even small pots. 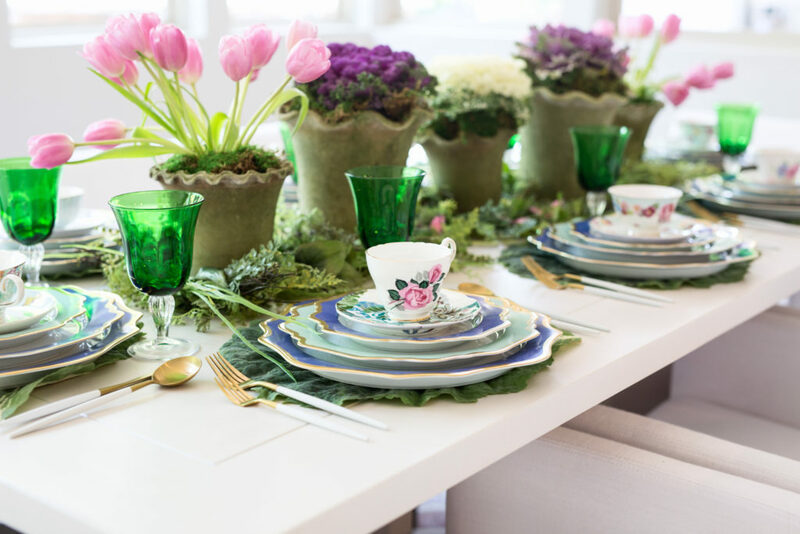 Here’s how I took advantage of what I already had, only buying a few small items, for my pretty Easter table! These pots are actually covered with live moss, which means they will continue to grow after you’ve planted flowers in them! I love the “pie crust” edge of these too. How pretty do these ornamental kale and cabbage plants look when potted? The colors of the leaves radiate out from the center. Such a unique look! 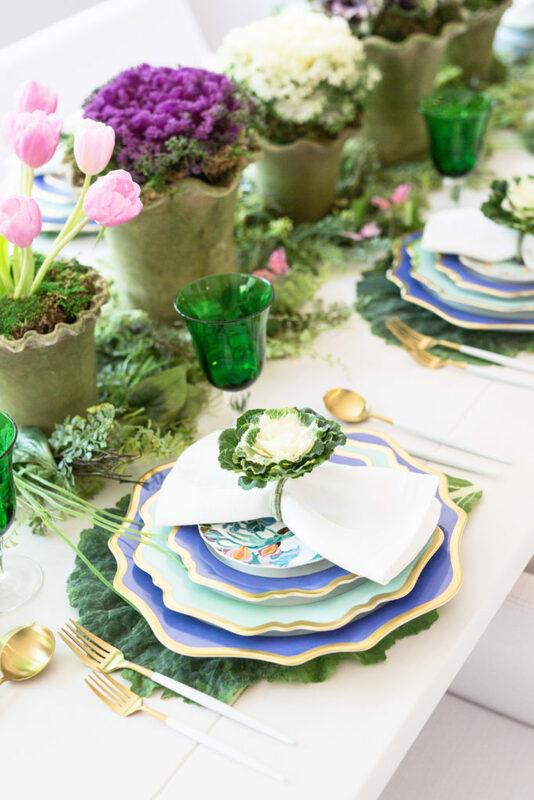 Cabbage was a theme I carried throughout my Easter tulip table, starting with these napkin rings. 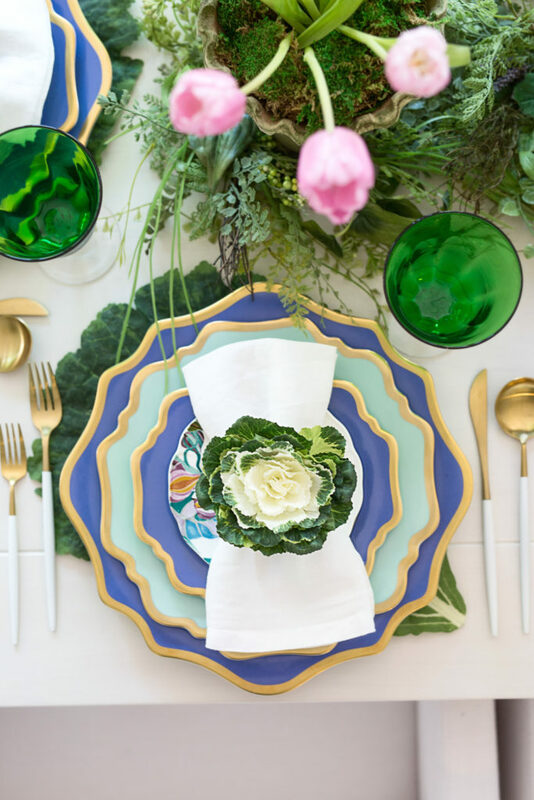 I also used cabbage leaf placemats under my treasured Anna Weatherley plates. By planting these directly into the pots, the water permeates the terra-cotta, thereby keeping the moss alive. I purchased them at a local home decor boutique, The Willows. 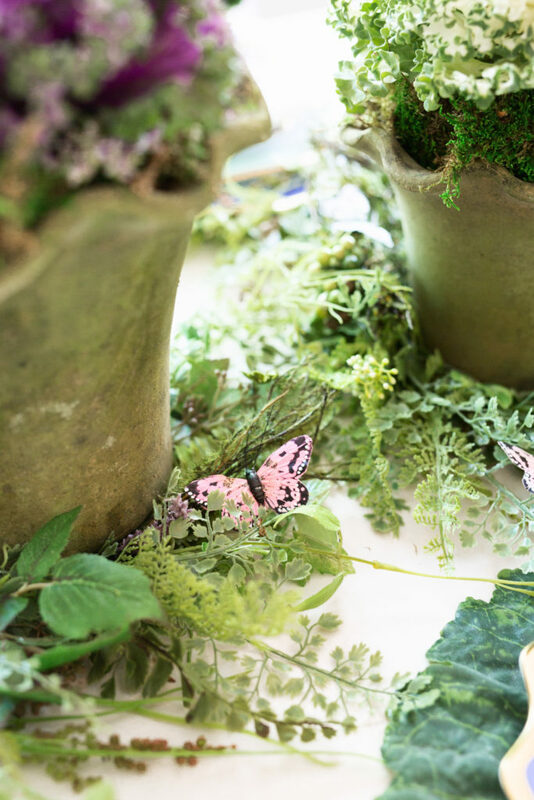 Round faux greenery rings make it very easy to simply place any pots or flowers directly on them for a pretty garden effect. I found these clip-on paper butterflies at a craft store. I’ve used these cabbage placemats for Spring, Summer, Fall and Winter – they work for every season! 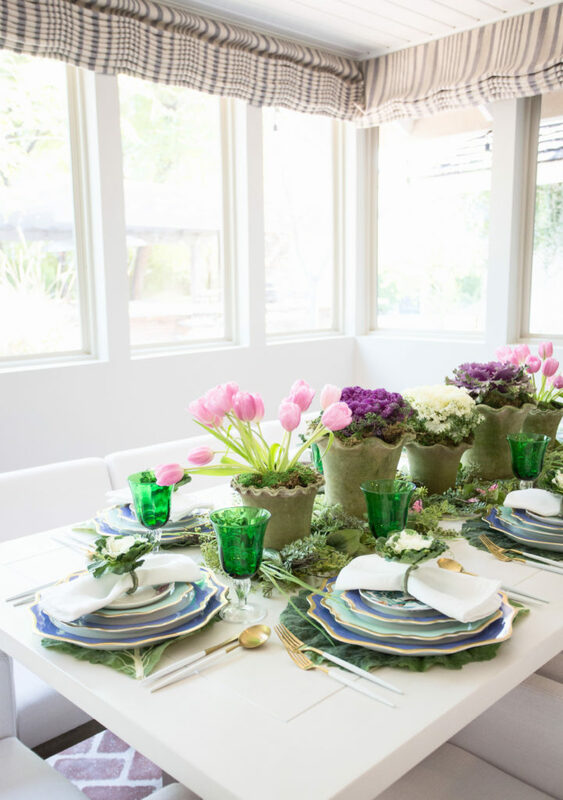 Windows surrounding this room allow a view of my backyard while enjoying a floral garden right on the table! Ready to celebrate Easter with friends and family! 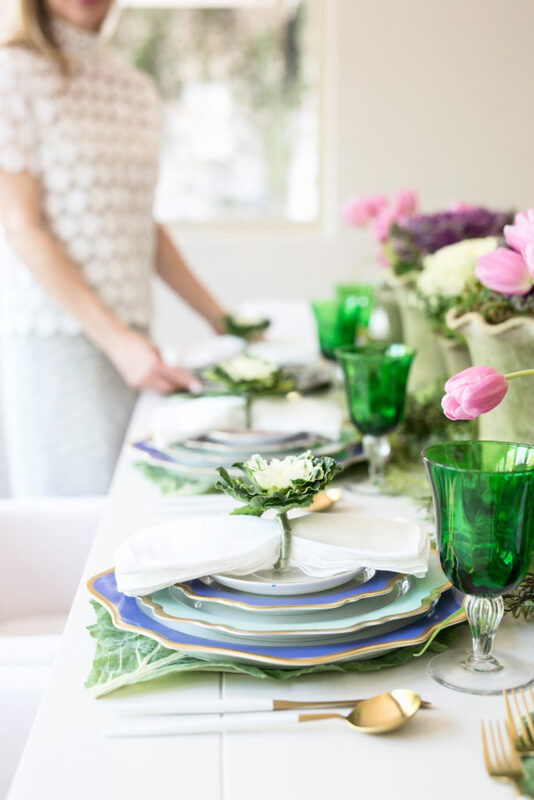 I love using tulips for my tables when they’re in season – here’s how I used them for this green and yellow tulip table. Thanks for coming along! Hope you enjoy Easter with your loved ones and have a chance to treat them to a brunch or dinner at your home!